THERE SEEMS to be some confusion about why it is important that authors and performers are able to make a living through payments for the use of our work. There are high-minded arguments: particularly that our being able to do this is essential to democracy - consider a world informed only by sponsored features and school textbooks. There is a personal angle, too: enough time has probably passed that it is appropriate to report the following tragedy in three acts. 1I met John Perry Barlow in a bleak beige basement conference room in Washington DC in 1992, just two years after the World-Wide Web was launched. We were ostensibly there to report a conference on "open source intelligence" - exploiting the expected firehose of information to supplement the "closed" work of traditional intelligence agencies. I was there to see who turned up from this interesting new virtual world. So, I think, was John: and he was on another mission. Until then known as a songwriter for the Grateful Dead, John was a rancher from Wisconsin who was involved with the state Republican Party. The Dead were famous for allowing or encouraging their fans to tape their concerts - making their living from those live performances - with diehard fans criscrossing the world to attend and tape more concerts. In this John saw a model for the entire online economy. Authors and performers would give up trying to collect payment for our now-infinitely-copyable works. We would make our living from live performances. ...in the years to come, most human exchange will be virtual rather than physical, consisting not of stuff but the stuff of which dreams are made. Our future business will be conducted in a world made more of verbs than nouns. ...The thoughts in it have not been "mine" alone but have assembled themselves in a field of interaction which has existed between myself and numerous others, to whom I am grateful. They particularly include: Pamela Samuelson, Kevin Kelly, Mitch Kapor, Mike Godwin, Stewart Brand, Mike Holderness, Miram Barlow, Danny Hillis, Trip Hawkins, and Alvin Toffler. Meanwhile, I had been thinking about my "moral rights" in my work. The "moral rights" to defend the integrity of the work and identification of its creator were then hardly known in the US, where they exist only for works of visual art produced in a signed and numbered edition of 200 copies or fewer. The needs of the citizen and of society for trustworthy news and innovative entertainment are best met by the direct relationship of the citizen with individual human authors... Such a relationship forms the legal basis for a People's Media - for the potential of the technologies to be developed to maximise open and trustworthy communication with and between citizens. We had moved to almost opposite conclusions. 2Jaron Lanier is best known for coining the phrase "virtual reality" in 1987. He is also a musician and collector of early musical instruments. Jaron seems to have taken John's idea up enthusiastically. It was certainly influential - often dumbed down to the denial that anyone, anywhere, wants to be paid (except perhaps by corporations using them as astroturf) that we see in the weird world of anti-copyright lobbying). But then in 2012 he published Who Owns the Future , in which he argued that authors and performers being paid for the distribution of our work was absolutely crucial. Indeed, we should all be paid for our social media postings - because they, alongside the unauthorised copying of professional creators' work, are where the profits of Twitter and Facebook come from. Some digging finds a 2013 talk at the Conway Hall in London in which Jaron recounts how he noticed how often he was playing benefit concerts for musicians who had given up on income from publication and distribution, spent the money from performances - and now couldn't afford healthcare. Do read Jaron's book - and the followup You Are Not a Gadget: A Manifesto . 3John gave up on much income from publication and distribution of his works and spent the money from performances. He suffered a heart attack on 27 May 2015, while in hospital after surgery following a Staphylococcus infection. He spent months in hospital - and the John Perry Barlow Wellness Fund was established in October 2016 to allay outstanding medical bills. A benefit concert was held on 11 October 2016 at Sweetwater Music Hall in Mill Valley, California to benefit the fund. 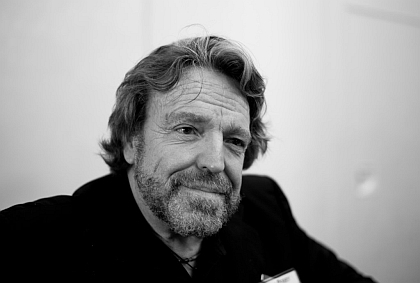 John Perry Barlow died on 7 February 2018.